The Nobels in Physics and Chemistry. The Nobel Prize in physics in 2011 was shared between four people: Americans Saul Perlmutterm from California University, Lawrence Berkeley from National Laboratory in U.S. and Adam G. Reiss from John Hopkins University and Space Telescope Science Institute in U.S. as well as Australian Brian P. Schmidt from Australian National University. They were the ones to discover that the universe’s expansion is constantly accelerating. The Nobel committee said that this discovery “shocked cosmology”. The key and “shocking” element of the rewarded discovery was the establishment that the universe is getting bigger faster and faster, and galaxies accelerate whilst escaping from the center. The Nobel committee announced: “It means that all in the universe will end in ice”. The galaxies and star systems will be as far from themselves that light from stars would not be able to get planets warm. The Nobel Prize in chemistry was awarded to Israeli Dan Shechtman. He discovered quasicrystals. They are solids whose order is different to normal crystals. 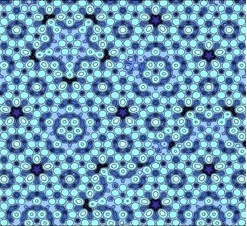 Atoms in quasicrystal molecules are arranged regularly but uniquely. Quasicrystals are in the most durable steel which is used to make razor blades or surgical needles. The Nobel committee announces that materials constructed from quasicrystals are exceptionally immune to corrosion and sticking. They are good thermo-electrical materials and change heat energy to current. Seventy-year-old Schechtman works at the Israel Institute of Technology in Hajfa. « Amazing sky in first week of October.